One of the things that keeps us in the Big Apple after (gulp) nearly 37 years is the musical riches the city offers. There are dozens of combos, large and small, playing the music of the Cladrite Era, and most of them acquitting themselves very well. But the granddaddy of them all is Vince Giordano. Vince and his Nighthawks specialize in jazz (and jazzy versions of pop) music from the 1920s and ’30s (they can handle ’40s tune with aplomb, too, you may rest assured). The first recommendation we make to friends (and friends of friends) who are planning to visit NYC and ask for tips about fun things to do is that they make sure to be here on a Monday or Tuesday night when Vince and Co. play their regular gig weekly gig. You’ve likely heard the Nighthawks, whether or not you’re aware of it. 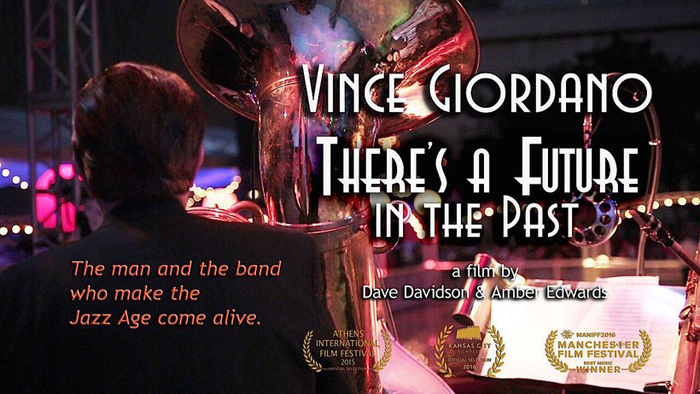 They did all the music for Boardwalk Empire (they even won a Grammy for their efforts) and have done period music for a great many movies (including Scorsese’s The Aviator), but if you’d like to dive deeper, we recommend you check out the 2016 documentary, Vince Giordano: There’s a Future in the Past. It’s available for purchase, but if you have a membership with Kanopy.com (a streaming service that your library may well include with your library card), you can stream it for free. (You can also rent the film for three bucks on Amazon Prime and iTunes). It’s 90 minutes very well spent. You’ll hear lots of great music (of the sort we enthusiastically feature on Cladrite Radio) and you’ll get to spend some time behind the scenes with Vince and the boys. But we must warn you, the movie will likely spark in you an irresistible yearning to visit NYC and catch Vince in person. He and the Nighthawks currently have a steady gig at a midtown spot called Iguana; you can catch them there on Mondays and Tuesdays almost every week (though it’s a good idea to call ahead to make sure it’s not one of the rare weeks that they’re playing elsewhere). Still, it’s worth the risk. If you’re a fan of Cladrite Radio, you’ll find yourself tapping your toes to this movie, too. Support Cladrite Radio on Patreon! Keep Cladrite Radio Alive and Streaming! Want to show your support for Cladrite Radio? Help us cover our operating expenses!